Wolfe painted this series of large scale Native American portraits over a period of 20 years, beginning in the early 1970’s. 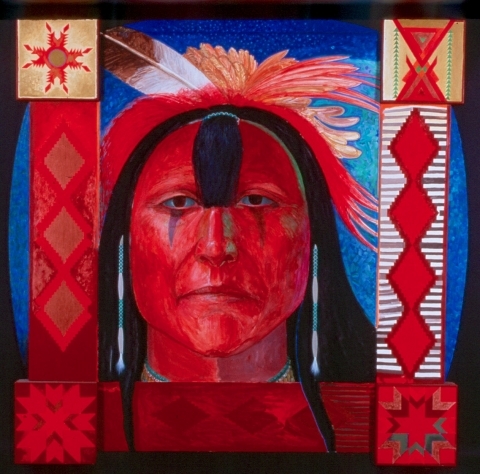 Each painting, which measures approximately 72” x 72,” presents a contemporary Native American person in direct eye contact with the viewer. The series represents Native American people from a range of tribes and nations across the United States. Wolfe addressed this work to white America, with the goal of providing an emotional and aesthetic experience which could move viewers toward a recognition of the past and current oppression of native peoples perpetrated by the dominant culture, and could promote greater compassion, connection, and respect for individuals and communities in their resistance to overt and structural violence. Wolfe painted three portraits of Leonard Peltier, an AIM (American Indian Movement) leader jailed after an unjust legal process, depicting him first upon entery to prison in 1978 and over the course of his over thirty years of incarceration. Wolfe’s triptych portrays three AIM members. In the sunglasses of the AIM figure on the right of the triptych is a reflection of casualties of the Wounded Knee 1973 battle of Native American activists and U.S. armed Federal forces. The background of the left panel depicts the disastrous strip-mining of Native lands.